Yesterdays Entertainment sale at Bonhams included an Inverness cape worn by Jon Pertwee (see right). Although it was not from his era as The Doctor, it had been worn for the numerous personal appearances, photo-calls, as well as for his role in Dimensions In Time. I wrote about this very cape in my Costume Index Appendix a couple of years back. Having seen it first hand at the viewing, I was disappointed by its construction, thinking it a bit cheap and nasty. That said it was worn by the man himself, and a buyer was sufficiently impressed enough to pay £4,800 for the privilege of owning it. The accompanying velvet smoking jacket that had been worn with this cape had previously sold in 2009 for £5,400 (see left), making the whole ensemble some £10,200!! This isn’t the first time a non-cannon classic series costume has gone for decent money. Back in 2007 another ‘replica’ Pertwee outfit sold for £9,600 at that year’s Entertainment Sale. It too had an Inverness cape plus smoking jacket and sonic screwdriver! 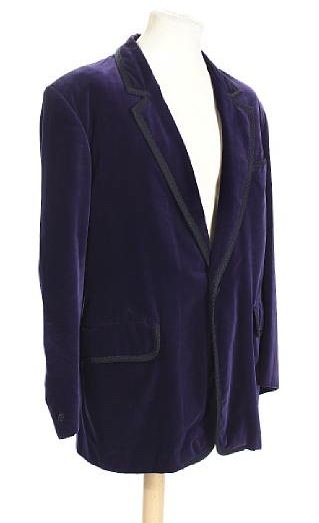 I’m not sure when it had been worn, or even if Pertwee had actually worn it. The catalogue listing said it was for exhibition purposes, so if anyone can tell me when and where it was displayed, do let me know.